What Are Some Interesting Facts About White Tigers? 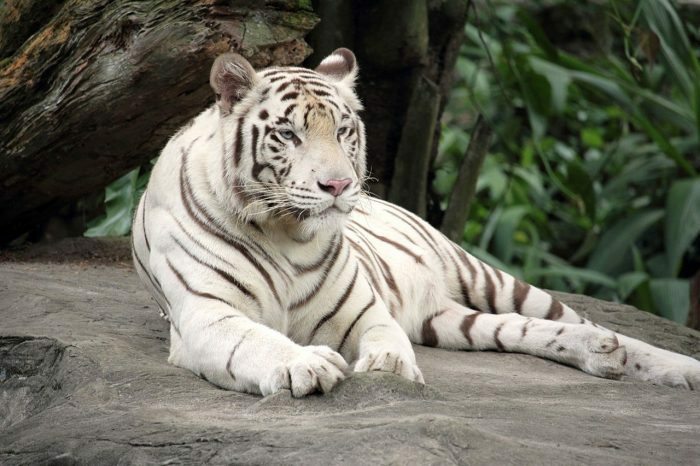 White tigers are mutated variants that received one copy of an uncommon recessive gene from each Bengal tiger parent. Identified by scientists as the SLC45A2 gene, this hereditary component is responsible for causing the variation in fur color from the distinctive orange coat in Bengal tigers to the characteristic white fur in white tigers. Due to their prominent white coloration, people sometimes misconstrue white tigers as albinos. However, the SLC45A2 gene is associated with melanin production, which is the pigment responsible for dark skin, eye and hair color, and the reason why the coat of white tigers is interspersed with dark stripes. Some experts advocate for the continued conservation of white tigers. However, other scientists suggest that these animals should be allowed to naturally die out, due in part to the congenital defects common in white tigers.